ATHENS – Greek taxpayers cannot handle any more increases to their tax obligations, and the country needs to find new sources for an economic recovery. On December 13th Poul Thomsen, the chief of the mission of the International Monetary Fund, held a telephone conference with members of the press, summarizing the Fund’s assessment of the current economic situation in Greece, published on the same day. Poul Thomsen suggested that Greece has relied too heavily on raising taxes in its efforts to close the national budget deficit, saying that the country has reached the limits of what can be achieved through tax hikes and new tax measures. According to the IMF, in the future Greece will need to shift its focus to expenditure cuts and more efficient use of government resources, when looking to improve the country’s fiscal balance. The IMF’s assessment of Greece found that overhauls to the tax system planned by the government in 2011 were running behind schedule, and none of the measures were shown to be effective enough to make a significant positive impact on the national financial climate. 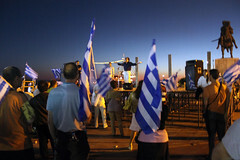 It is not yet clear whether Greece will need to impose even further austerity measures in 2012, although the IMF is already saying that under current conditions it is likely that the government will miss its target of reducing the budget deficit to 9 percent of the GDP next year. However, according to the report the country’s battered economy is already struggling under the repeated austerity packages, and further measures might only serve to buckle the economy more.